How Much Does a Starbucks Puppuccino Cost ? Mono and Diglycerides, which are fats that serve as stabilizers – to provide a consistent texture and prevent separation. Carrageenan, which is essentially what makes sure the liquid remains mixed. How many Calories are in a Starbucks Puppuccino ? Because serving size varies, the only information we found regarding calories is Whipped cream is approximately 50 to 110 calories and 5 to 11g of fat. Please note this post is not intended to provide medical or dietary information, information was provided by Starbucks Customer Service. Find out if Starbucks Puppuccino are Good or Bad for your Dog ? Loved how the cashier on the drive thru asked me if I would like a Puppuchino for my dog. By the way he loved. He tends to bark at everyone but he didn’t bark at her. The Starbucks in Berkeley, CA charge for puppuccinos! The guy was going to charge me $1.65 today. I canceled. One other time I asked here and they said it was $3. Leave it to Berkeley to charge for what everyone else graciously provides for free. I work we Starbucks and for sometime last year we were told from management/corporate not to give out anymore puppuccino’s because they found it to be really bad for dogs, especially their kidneys. After a few months of denying customers puppucinnos (even explaining how it was discovered it is not good for dogs) they would say “fine! Then just give me a cup of whip cream” (We couldn’t deny them this. We could only deny a “puppucinno” so this was there way around that.) After a few months of this, I suppose Starbucks received enough customer calls because corporate decided to start giving out these puppucinnos again. Same exact recipe, still just as bad for your dog. Starbucks I guess decided if you want to give your dog something that is proven to hurt its kidneys then by all means, we shouldn’t stop you. Just like we couldn’t stop you from giving your dog a chocolate crossiant from our bakery. So, do with that you will but as a dog owner and a 5 plus year Starbucks worker I would never give my dog a “puppucinno”. Pingback:	Gift Guide for a Pet Lover - New Age Pet™-The Best For Your Pet! Sorry to be a party pooper… But, here on this website you have provided the incorrect ingredients for Starbucks whipped cream, it’s filled with sugar from the vanilla syrup they use in their whipped cream preparation. You can confirm this via Starbucks. And I will also add, shame on Starbucks for offering this to our dogs, is everyone forgetting that dogs aren’t supposed to have sugar, it’s terrible on their little kidneys. 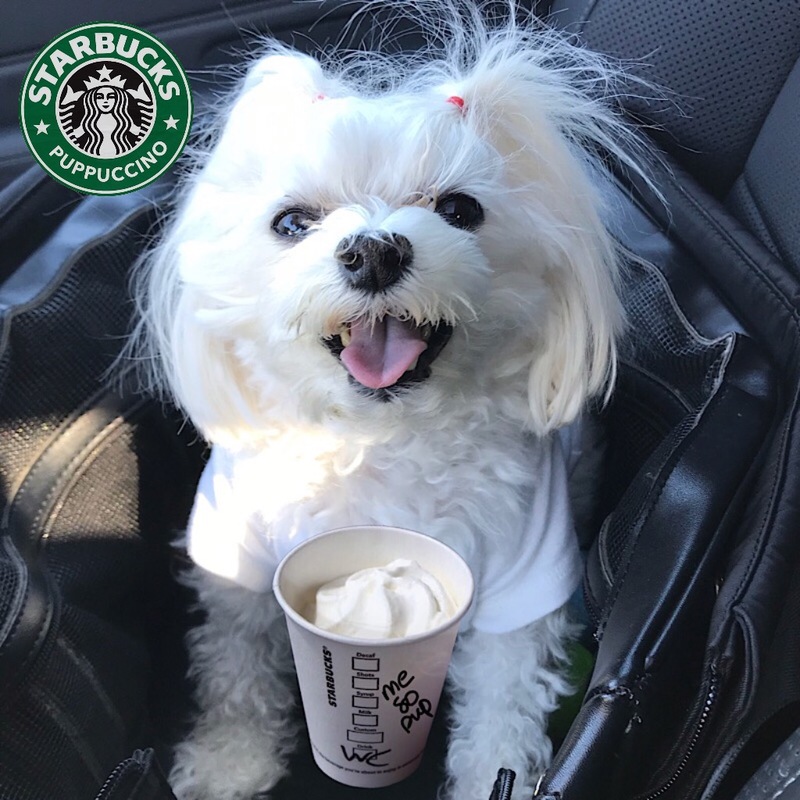 Please don’t give your dogs the Starbucks whipped cream! I’m emailing them next, I’m a 100% “coffee lovin’ Seattle-lite”, and I have 2 pups of my own. Starbucks just needs to go back to giving mini dog bones out, like all the other smaller espresso stands do in our state. Thank you for your comment and information. The ingredient information was provided to us by someone at Starbuck’s corporate office – via email. We will contact them again to verify the information above. As stated, we do not suggest that it is good nor bad – as we have no background in this. Thank you again. I work at Starbucks (thankfully in a Ralph’s) and I always tell customers we don’t do that here for that main reason. I will not be responsible for your dogs death due to kidney failure. Maybe they could give the dogs something that would actually be good for them? I just don’t think it’s a good idea too much sugar and many dogs have problems with dairy. Yes, agreed. It’s more of the gesture that they are thoughtful enough to include our fur babies. Not sure if they serve anything that would be good for dogs, except for ice water. This isn’t a Starbucks menu item on the first place. I can’t believe how uneducated these article writers are to write “it’s on their ‘Secret Menu'”. We don’t have a secret menu!! And we certainly aren’t supposed to be serving HEAVY CREAM with 8 PUMPS OF VANILLA SYRUP to customer’s dogs. A short cup of whipped cream could be enough to kill a small sized dog. This fad needs to stop before some dog gets killed. Thank you for your comment. We believe that Pet Parents do need to be responsible when giving their pups a “treat” as many, many “treats” can be dangerous, especially to our little PupSize ones. It is always recommended to check with your trusted vet. The information we received is from Starbucks – in regards to the ingredients for their secret menu item – a puppuccino. We also think that a “secret menu” item is anything that they don’t typically offer, and that a customer can order. Thank you for your comment. We put 8 pumps of vanilla syrup in each canister of whipped cream, so that ingredients list is incorrect. Do not order this or serve it to your dog, especially small ones as their blood sugar will spike. Thank you for your comment. The list of ingredients came directly from Starbucks. It is always best to check with a trusted vet, as some pups are very sensitive and have specific diets. I live in California and a nice barista noticed my little daschund, Daisy, in the car with me in their drive-thru and asked if she’d like a puppucino. Daisy was so happy and loved it! ? We love when business acknowledge our little furry family members and wish more businesses would be more pet friendly. Thank you for your comment. Kona, my MinPin, was given a Puppucciono last year at a Starbucks in Oregon. I was so happy to see that they noticed our dog in the car and offered it to him without even having to ask. Kona ate is so quickly and I was thrilled to see him get a treat too. Thanks for posting this information, I was curious. We love businesses that spoil our PupSize dogs. Our pups are family.